Art Publishing Co., Glasgow. 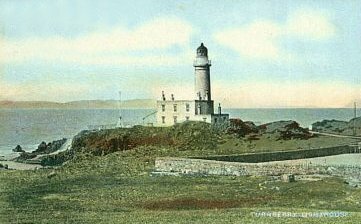 Card posted from Maybole in 1906. Marcus Wards Series No. 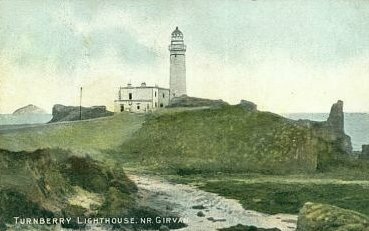 78274, printed by McCaw Stevenson & Orr, Ltd. Card posted in 1906. 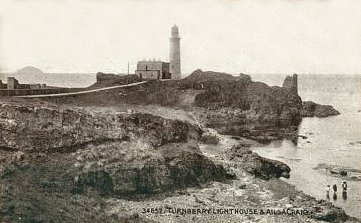 Turnberry Lighthouse as it looks today. 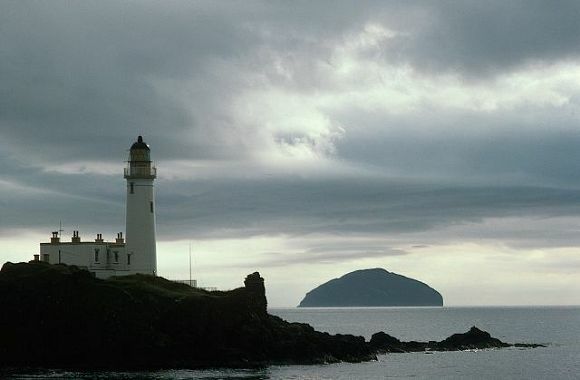 There are only two outstanding historical events connected with Turnberry. 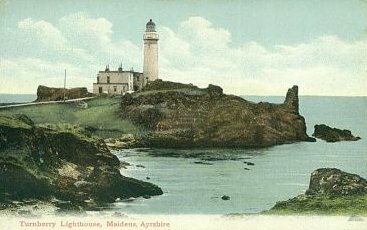 The first was a meeting of the Scottish nobles held here in 1286, to take steps towards promoting Bruce's claim to the Scottish throne. And the second was the above-mentioned attempt made by Bruce in the spring of 1307, to recover the Castle from the English into whose hands it had fallen. This attempt was only partially successful, although ultimately it led to the withdrawal of the intruders. There is very little of the old building left now. Still it is interesting to mark the ditch which defended the castle on the landward side, and to put one's fingers into the groove of the old portcullis which in those days did duty for a gate, and to scramble down into the cave which leads out into the sea, and which must have served the castle inmates as a harbour. 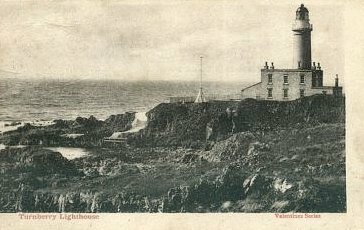 A modern Lighthouse now occupies the place where once armed warriors marched, and watchful sentries stood. 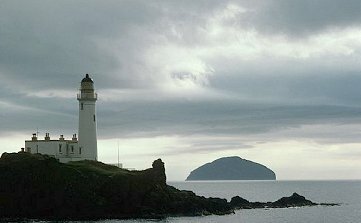 But it needs little effort of imagination to people the spot again with all its martial life, even to the little toddling steps of him who was one day to become Scotland's greatest king. TURNBERRY CASTLE Artist: D. O. Hill S. A. Engraver: J. Horsburgh Turnberry, spelled in old writings Turnbiri, Tornbery, and T'urnbym, was, in the twelfth and thirteenth centuries, the principal house in Carrick, and the seat of a powerful race of native chiefs, derived from Fergus lord of (galloway, and designated Earls of Carrick, who possessed the supreme influence in this mountainous region previous to the rise of the Kennedies. 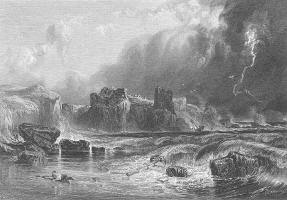 The castle was situated on a rock at the extremity of a low peninsula, within the parish of Kirkoswald. 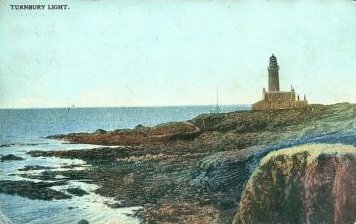 The sea raged, in front at the base of the rock, and even found its way, by a creek, into the interior of the fortress. Behind, the low territory just mentioned formed a pleasant domain, on which rose a small town, long since obliterated from the Boil. 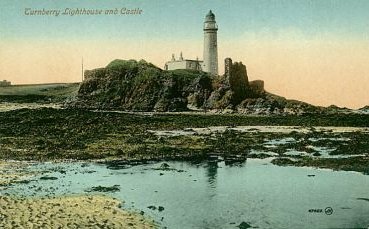 The castle itself occupied about three-fourths of a Scottish acre, and must have been originally an impressive structure, especially seen from the sea; but only a few feet of the walls now remain.